"Ancora Imparo" - I am still learning ~ Michelangelo I am a 60-something, 'career-graduate' librarian. One of the items on my life list has been to learn quilting, especially to explore the arena of journal and art quilting. 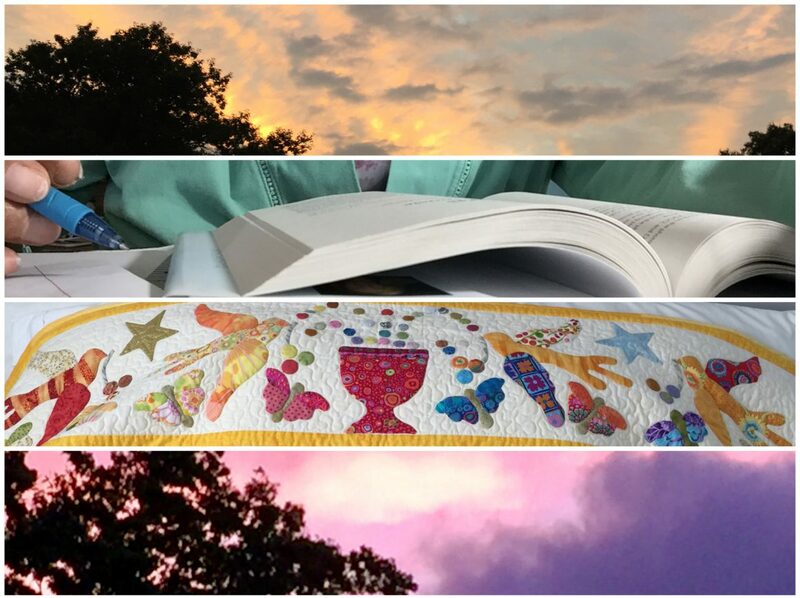 I see that quilting, art journaling, blogging and scrapbooking are all facets of creativity and learning in this phase of my life. On this day, next week, we will be in the throes of setting up the quilt show – the doors will open at 10 am, promptly on Thursday…to a crowd of quilters rushing into buy our castoffs: tools; fabrics; patterns; novelty items; etc...”one quilter’s trash another quilter’s treasure…” Three of my four quilts are ready; I finish stitching the binding on the fourth, today! I have any number of books – new/old; audio/print – in various stages; I’m rather drifting in/out of them. In my ongoing dostadning efforts, I ran across these three titles and decided I might revisit them over the next few days. The weather forecast for today: sunshine and lovely temps. I plan/hope to take a walk to the Franciscan Monastery early afternoon to view the grounds. I’ve not been at all this season. Who cares about spring allergies? Joining Kat and others for Unraveled Wednesday here! thinking: I love that every month in this year has a ” x. 19.19″ date…don’t ask me why, it’s just one of many small quirky things that make me smile…or is it the product of an idle mind? gardening: Jason, the young man who tends the yard, was here yesterday… everything looks a sight better for sure. Chris (my niece) wants to garden. Since she lives in an apartment building, she asked if she could use my back yard as her learning field and also let her pup Hazel, romp. I didn’t hesitate to say YES! Still recovering from Sunday’s 12K walkathon…adding yesterday, another 8K+. I normally average circa 5K on a daily basis, weather and other factors permitting. Today’s incentive: spend several [more] hours in my craft room, purging and reorganizing – bringing outer order and inner calm to my creative memory keeping environment as well as my mind. Calmed and ready for a break – a treat – I journeyed to my favorite (and only) local coffee shop within walking distance. On the way there and back, I listened to the latest edition of What Should I Read Next ? ~ Modern Mrs Darcy podcast, episode 180. This week’s featured guest, Liberty Hardy, host of BookRiot’s All the Books podcast, read 600 books last year! Reading is her full time j-o-b! And then some! Can you imagine? I encourage you to listen to the podcast -even if you’re not a podcast listener. It was fun …and I’ve added Liberty’s fave author: Elizabeth McCracken’s Giant House: A Romance to my TBR list – I don’t usually read fiction in this genre but this one sounds like fun so I thought I might give it a try…any one read it already? The Quilt Show is two weeks away, May 2-4, and I’ve just a few loose ends to tie up…but for all intent and purpose, I. am.ready. Joining Kat and friends for another UW. What’s unraveling – or not – in your life these days? It’s been a quiet, delightfully so, morning and so far, afternoon! today, I did not have any.place.to.be other than to sit here at the table, all morning long, taking it easy, easy, easy! Yesterday, I clocked more than 12K steps: the Selfie Queen – niece Chris – and I went to the annual White House Garden Spring Tour…we were among the hundreds. We enjoyed the tour and as Chris said: the flowers know no party. Despite the day’s being overcast, the Smithsonian Mall and museums were busy, busy. From the gardens, we walked to the National Gallery of Art’s Sculpture Garden and Restaurant – where we ate lunch and rested…and then, Chris called Uber to take each of us home. I was wiped out by the time I arrived home – as I pen this post, am still. But that’s been quite OK ’cause I have no place to go today or anything due! Today I’ve been sitting here at the table, since early this morning, watching Mother Nature blow the clouds in and out, the sun come and go. @ IKEA. Just finished lunch: salmon. salad with blackberries,walnuts, blue cheese and ranch dressing . yummy. best coffee, ever. appt this morning: new doctor, about a year ago. he’s funny and so easy to talk to…relaxed, attentive, relatable… all’s good…encouraging, always …spring is really here…today: blue sky dotted with puffy white clouds, lots of sunshine. 67 degrees…near day’s high…happy flowers…happy birds…happy people…finishing Austin Kleon’s first book: steal like an artist: 10 things nobody told you about being creative… format & style just like newest … both are quick reads, filled with lots of pithy advice and ideas…especially good tips for forming/strengthening habits….power hour yesterday … roared through household chores…felt good to have them off the menu…Outer Order indeed Inspires Inner Calm. time to go… wander through the store … treat myself to a soft cone on the way out…head for home. @home, just awakened from a short nap…spring indeed has arrived…sleepy…tree pollens… or something in the air… Dolly sent text: she wants to learn how to sew, make clothes…funny, I was looking through my ginormous photo library – oh how it needs to be weeded – ran across several pics of Dolly, easily 5-6 years ago, trying out my sewing machine; she took to it quite readily, I seem to recall …what goes around comes around. joining Kat and friends for another round of unraveled wednseday. And that’s a good thing! Always welcomed! Here’s hoping that your week also has just the right balance, too! I kicked off the month with an email from the host of Sunday Baroque: I’d written because I wanted to listen to the program as it was being broadcast and I wasn’t having any luck finding the right channel! Listening has been wondrous every Sunday since. To that end, on Sat, 30 March, I attended the 5 hours’ long live presentation of Wagner’s Die Walküre, boradcast in High Definition and shown in local movie theaters – in over 70 countries. T’was magic! The merry-go-round – # 22 – is a just.because. #27, my friend Kathy. Our newest family member, Hazel the labradoodle – niece Chris’s pup: #s 8, 9 & 29. Chris informed me that Hazel has her own Instagram account. She, Hazel, that is, has been approached for modeling gigs ~ she’s very photogenic, according to Chris! Looking forward to all that April will unfold. Have a great weekend! As one can see, my main task today is TAXES! Fun – not… but I do have two new additions to MSQT: Austin Kleon’s Keep Going, released just yesterday and a new iPad mini, added to my collection of iToys, er iTools! I read a review about a 10 days ago that gave the new mini not only highest remarks but also casually mentioned the Apple Pencil worked with it! SOLD! And so last Friday, when I went to pick up the new microwave oven I also got the new iPad mini, 5th generation! I started Austin Kleon’s new book this morning; the subtitle is “10 ways to stay creative in good times and bad,” essentially establishing different habits! Austin, a writer, also draws and creates redacted poetry from newspaper articles. Stitching continues on the quilts for the Quilt Show, just a month away. I’m stitching – by hand – the binding on the big quilt. That will pretty much wrap everything all up and I can focus more attention on making a few novelty items to sell – we have over a 1,000 ! – plus the quilting supplies, books, etc that no longer spark joy! At least, not for me! The forecast today offers sunshine! Hope it’s yours too! Joining Kat and friends .